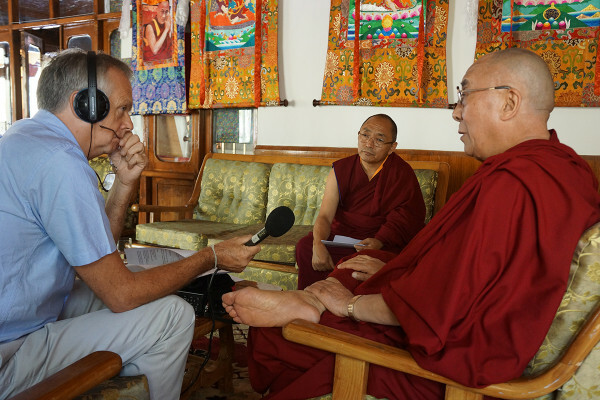 His Holiness the Dalai Lama being interviewed by Anthony Denselow, Leh, Ladakh, India, August 2012. Photo by Jeremy Russell. Anthony Denselow is “a class of ’73 Kopan survivor who has followed Lama Zopa Rinpoche’s work around the world with deep admiration.” He is also hugely grateful to Jamyang Buddhist Centre’s Geshe Tashi for his inspired Foundation of Buddhist Thought course. Anthony worked for BBC radio for over 30 years and is now freelance. The sessions were organized thanks to Jeremy Russell, a member of the team that frequently travels with His Holiness and lives and works in Dharamsala, India.